At every celebration of Sunday Eucharist, the church recites the creed as a body, serving to remind us of the foundations of our belief as Christians. But at the Easter liturgy, the church omits this. Instead, something significant takes its place – we renew our baptismal promises. We do this in two parts - firstly we reject sin and evil, and following that we renew the promises and tenets of our belief, responding with a resounding and resolute “I do” after each of the questions asked. Empty show! How succinct, and how deep this truth runs. All of sin, all temptations and all that evil stands for is truly an empty show. It is empty of fulfillment, so often devoid of truth, and vacuous in its promises of true and lasting happiness and joy. Yet, we so often fall prey to these empty shows, don’t we? Being constantly alert to this ‘empty show’ is our only key to keep ourselves on that path to true holiness and wholeness, where as it were, we have an internal ‘radar’ which spots and identifies these false ways of living. The more we are tuned in to God in our lives, the easier it is for us to be sensitive to the ways this emptiness makes inroads into our hearts and lives. The giving in to these empty shows inevitably end up making us even emptier than before. We only need to think of any sin that we have committed in the past, and will see the truth in this. Before the act, it did appear to be a good thing; something very attractive and often strangely alluring. Committing the act always seemed to give a hope of some element of joy that would make us happy, but after falling prey to its gossamer promises, the result is always flat, and the apparent joy promised always leaves us disenchanted and somewhat disabused. Sin always is an empty show indeed. What is the promise of Easter for us but the fullness of the truth that God and goodness trumps all the emptiness and hollow exhilarations that sin and evil purport to give. It becomes truly significant then that Easter gives us something that is also an empty show – but only in this case, it is the showing of an empty tomb! In the Easter event, it is God’s empty showing of the tomb – a tomb that could not keep the Son of God contained in death and darkness. God’s empty showing of the tomb upstages and stands head and shoulders above the barren and vacant thrills and evanescent delights that sin accords. God’s empty tomb is in fact his magnum opus, writ large, of his most powerful weapons in humanity – love and forgiveness. Satan’s empty show leads one to death. God’s empty show brings us all into life. This then, is the great promise of Easter which makes us unflappable even in the face of death. A happy and holy Easter to all! Alleluia! Thank you very much Fr Luke for this post. It pays tribute to what Easter stands for, reminds us of the key elements that anchor our beliefs and challenges one to follow Satan’s path which leads to disillusion and sure death or follow Christ to the tomb and wake up to a renewed life. 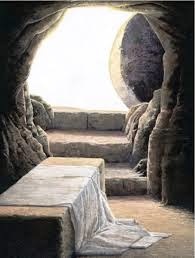 “In the Easter event, it is God’s empty showing of the tomb – a tomb that could not keep the Son of God contained in death and darkness.” - so death has been robbed of its prey. Every year, the readings on the Passion and Death of Jesus on Good Friday, invariably leave us with a deep sense of loss and confusion, a hollowness of soul that mutely and silently grieves the darkness of faith that seems to cast a pall over everything. This Easter, Fr Rolheiser encouraged us to look towards ‘Galilee’ - that special place in the heart where we should look for the resurrection......................a return to the hope and discipleship that can be momentarily lost when we despair and become discouraged from too many failed attempts and sufferings.